Rueil-Malmaison (French pronunciation: ​[ʁɥɛj malmɛzɔ̃]) is a commune in the western suburbs of Paris, in the Hauts-de-Seine department of France. It is located 12.6 kilometres (8 miles) from the centre of Paris. It is one of the wealthiest suburbs of Paris. The Rueil barracks of the Swiss Guard were constructed in 1756 under Louis XV by the architect Axel Guillaumot, and have been classified Monument historique since 1973. The Guard was formed by Louis XIII in 1616 and massacred at the Tuileries on 10 August 1792 during the French Revolution. At the end of the 19th century, Impressionist painters like Pierre-Auguste Renoir, Édouard Manet and Claude Monet came to paint the Seine River which crosses the town. Rueil is (despite the title) the principal location of the novel Loin de Rueil by the French novelist Raymond Queneau. 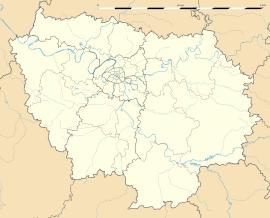 The town is twinned with Walton-on-Thames, Surrey, in the United Kingdom. The Château de Malmaison, the residence of Napoléon's first wife Joséphine de Beauharnais, is located in Rueil-Malmaison. It is home to a Napoleonic museum. The main campus of the French Institute of Petroleum research organisation is in Rueil. The city has also become home to many large companies moving out of La Défense business district, located only 5 km (3.1 mi) from Rueil, a trend first established by the move of Esso headquarters to Rueil. There are about 850 service sector companies located in Rueil, 70 of which employ more than 100 people. A business district called Rueil-sur-Seine (previously known as "Rueil 2000") was created near the RER A Rueil-Malmaison station to accommodate these companies. The business district is equipped with a fiber-optic network. Several major French companies have their world headquarters in Rueil-Malmaison, such as Schneider Electric and VINCI. Schneider had its head office in Rueil-Malmaison since 2000; previously the building Schneider occupies housed the Schneider subsidiary Télémécanique. Several large international companies have also located their French headquarters in Rueil-Malmaison, such as ExxonMobil, AstraZeneca, American Express and Unilever. Rueil-Malmaison is served by Rueil-Malmaison station on Paris RER line A. There are tertiary educational institutions in the area. Jean-Marie Le Pen and his wife, Jany Le Pen, live in a two-story house on the rue Hortense. ^ "Elmbridge Online covering Cobham, Esher, Oxshott, Walton and Weybridge". Elmbridge-online.co.uk. Retrieved 2012-07-09. ^ "Contact." (Map) Vinci. Retrieved on 7 July 2010. ^ "Schneider-Electric s'est installé chez une filiale." Schneider Electric. Retrieved on 8 July 2010. ^ "Les écoles maternelles." Rueil-Malmaison. Retrieved on September 7, 2016. ^ "Les écoles élémentaires." Rueil-Malmaison. Retrieved on September 7, 2016. ^ "Les collèges." Rueil-Malmaison. Retrieved on September 7, 2016. ^ "Les lycées." Rueil-Malmaison. Retrieved on September 7, 2016. ^ "Les établissements privés." Rueil-Malmaison. Retrieved on September 7, 2016. ^ "Enseignement supérieur." Rueil-Malmaison. Retrieved on September 7, 2016. ^ "Marine Le Pen, une riche propriétaire (comme son père)". Le Nouvel Observateur. January 27, 2016. Retrieved October 7, 2016. ^ "Partnerstädte" (in German). Bad Soden am Taunus. Archived from the original on 2013-12-14. Retrieved 2013-12-11. ^ "Partnerstädte". Stadtgemeinde Kitzbühel (in German). Retrieved 2008-08-04. Wikimedia Commons has media related to Rueil-Malmaison.